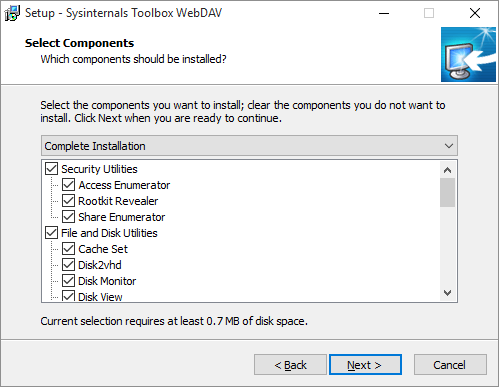 The Sysinternals Toolbox is a setup routine that will install WebDAV links to the utilities of Microsoft Sysinternals. All utilities there are always current and maintained by the Sysinternals team. For you, the tools are accessible from your Windows Start menu like any other, only that they are launched directly from the Sysinternals server. As many of you, I am using quite a few of the Sysinternals utilities. These utilities are very helpful freeware tools programmed by Mark Russinovich and Bryce Cogswell. Sysinternals was acquired by Mircosoft in July, 2006. Since then, they were constantly improved and updated. The tools aim at Windows file, disk, networking, security and process tasks and are well known to a broad community. Unfortunately none of the tools comes with a setup routine, you need to extract the files yourself and create your icons and start menu entries manually. I have collected my personal “most useful” selection of those utilities for Windows and created a setup routine so you can conveniently install links to them on your system. This package is now called “Sysinternals Toolbox” and can only be obtained here at Lewe.com. There are no Sysinternals Tools included in the package, only links to their WebDAV location are provided. Important! The links are created assuming that you have mapped the drive letter S: to live.sysinternals.com. The setup routine gives you the option to select the tool links you like to install. A Windows setup routine for the Microsoft Sysinternals Utilities. Creates menu entries linking to the tools directly via WebDAV.